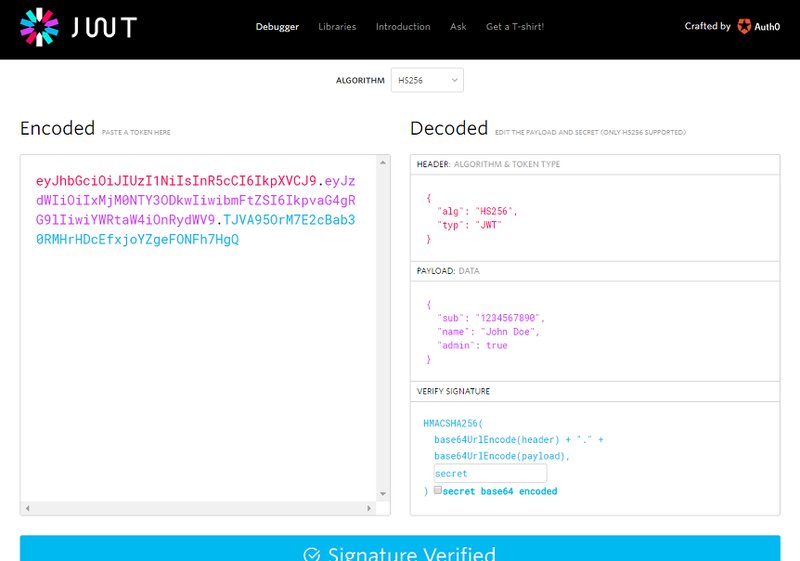 JWT OAuth uses digital signature to authenticate external application with Salesforce. JWT can be used to request an OAuth access token from Salesforce when a client wants to use a previous authorization. Complete Source code is available here. Developer creates a connected app and provides digital certificate in OAuth settings. You can refer this post to understand how openssl can be used to create digital certificate locally. We need to make sure this connected app is already pre – approved either by using WebServer, User Agent or any other flow. You can find this step in video recorded. We need to generate JWT token and sign it with certificate. This code snippet is available in this file in method getJWTSignedToken_nJWTLib(). I have used njwt module of Nodejs to create a JWT token. This is very useful website to validate and generate JWT token as per digital certificate. If JWT request is valid then Salesforce returns access_token , which can be used in subsequent requests to perform allowed operations in Salesforce via Nodejs application. 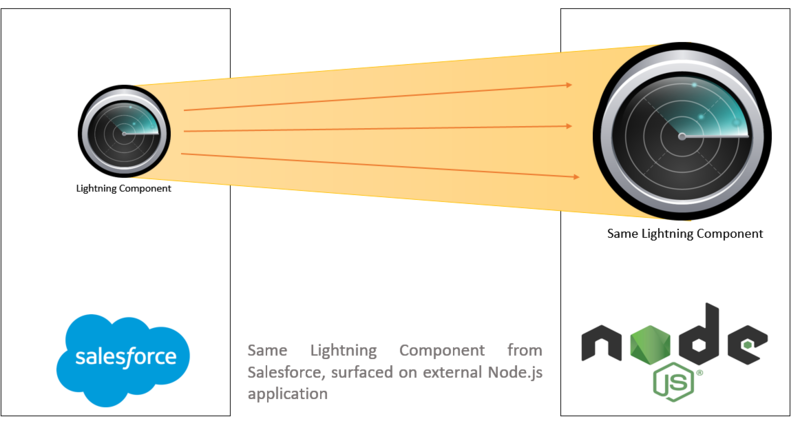 How to use Lightning component in node.js (External websites) by using Lightning Out. It shows how to enable CORS and SSL in Node.js with Video and complete source code. If you were the users of IGoogle, few years back, you would be excited to know that web development is progressing in that direction. Architect of web application development is getting shifted towards component based development by introducing concepts like Web Components and frameworks like polymer and Lightning Components. One of the possible use case of component driven development is ability to use whole component externally. In IGoogle, components were built by partners and then was exposed as widgets to be used on your custom Google home page. Salesforce product team, being visionary came up something like this by introducing Lightning Out. With the help of Lightning Out, we can surface our existing Lightning Component to external websites. Previously, we already discussed that how Lightning components can be used on Visualforce pages using Lightning Out. Workbench is one of widely used tool in Salesforce when it comes to exploring REST API of Salesforce. However I wanted to export REST API response in Binary format and therefore used cURL. cURL is open source command line library mostly used to test http request. It can be downloaded from here and official documentation about how to use cURL can be referred from here. 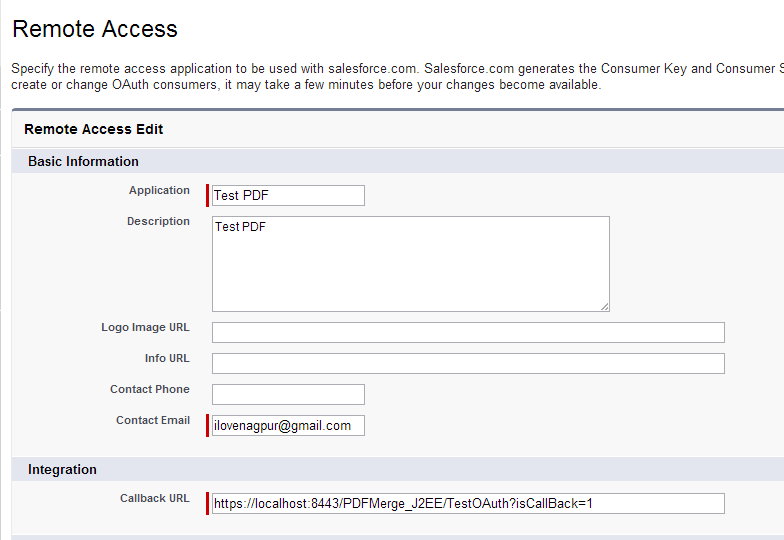 To use cURL with Salesforce REST API, we will need to use username – password flow of OAuth2. To use OAuth2, we need to create connected App. You can check “Create Connected app” section of this post. You can enter any URL for callback or if you have already created any connected app in past, then it can be used. After creating connected app, note “Consumer key” and “Consumer Secret” somewhere. make sure there is no space in above file. I have added some space for sake of readability. There are many ways to login to your Salesforce instance, using Google, Facebook, Linked, Twitter and even from other Salesforce Organization. I am sure many of readers has multiple Salesforce instances and its hard to remember password of each. We can connect every Salesforce instances and login using only one. In this post we will see, how we can login to one Salesforce from other using built in Authentication provider from Salesforce. Throughout this article I will use term “service provider Salesforce instance” for Organization where I need to go after login and “Authentication Provider instance” which will authenticate user and will act as source organization for login. First step to start with Authentication Provider is to setup my domain in your “service provider Salesforce instance“. This step is important so that it will display all available Authentication provider for that Salesforce instance. If you want to login from Facebook, LinkedIn or any other web application, you need to inform Salesforce that those applications are legitimate and this is very important piece of OAuth2. One of major difference between OAuth1 and OAuth2 is that OAuth2 provides scope where you can set what specific permission this Connected App will need. Connected App also has “Consumer Key” and “Consumer Secret” which is equivalent to “username” and “password” for that App. Other important setting, connected app has “Callback URL“. This is the URL where “Authentication Provider instance” should return after providing access. Even if somehow “Consumer Key” and “Consumer Secret” is compromised, it will return to Callback URL which is your application. Previously we have seen, How to setup SAML based Single Sign On Where Salesforce will be Service Provider and some other application like AXIOM will be Identity Provider. In this article we will use one Salesforce Instance as Identity Provider and other Salesforce Instance as Service Provider. Before starting you have to decide which salesforce Instance will act as Identity Provider and which one will act as Service Provider. To Avoid confusions, we can create app with different Logo to distinguish Identity Provider and Service Provider like I did.